The ModelOff London GTC is a two-day world-class technical training development program for the best and brightest Emerging Finance and Business leaders, and the best practitioners in London. 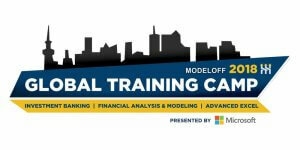 Join 150+ Professionals to learn real-world technical skills and improve your expertise in cutting-edge new topics in Business and Financial Analysis, Financial Modeling, Infrastructure, Investment Management, Private Equity, Treasury and Risk Intelligence. Quantrix will be exhibiting and speaking at the London Modeloff this May. Stop by booth to say hello to our experts!